Diversity is the buzzword of the moment. Everyone acknowledges that diversity is good for business, and there’s no denying that all the talk is leading to new programmes and training, as well as efforts to embed diversity into overall business agendas. Research shows that increased gender diversity leads to stronger ambition and engagement, greater creativity and resilience, and a more innovative working environment. Despite the clear research and the pervasive headlines, however, the pace of progress around the world continues to be discouraging. With such clear rewards for gender diversity, why aren’t more companies in the winners’ circle? It’s not for lack of trying. In fact, 91% of women we surveyed reported that their employer had a diversity initiative in place. But only 27% reported any impact from such programmes. It’s time for companies to solve the diversity conundrum and push for faster change. 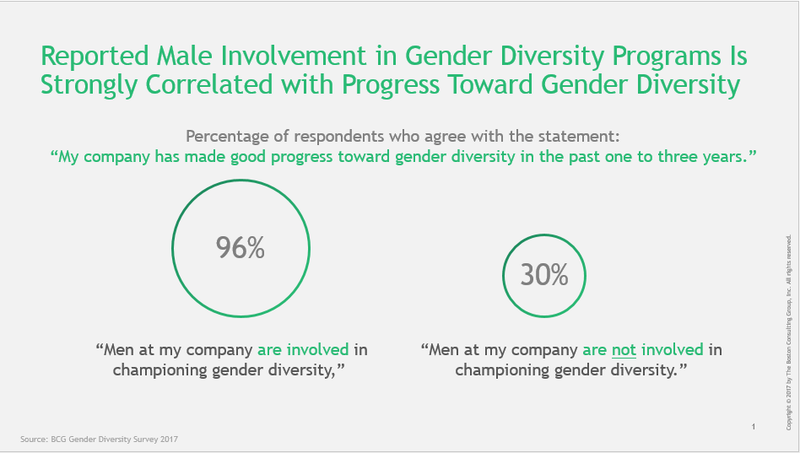 Change will not come unless company leaders think of diversity as they do any other major business priority. Diversity agendas are often isolated within HR or diversity and inclusion departments. Instead, the CEO must own the organization’s diversity agenda – and lead from the front. The first step is understanding your starting point and setting the right goal. Leaders must have a clear idea of how they stack up against their competitors in terms of diversity, and aim for an ambitious target. Next, track every level of progress by focusing on three leading indicators: recruiting, retention and advancement rates. And it may seem counterintuitive, but recruiting is not the most powerful lever of the three. Instead, improvements in retention and advancement will drive the most impact. In most countries, women are already entering the workforce in sufficient numbers. The problem is that not enough of them are climbing the ladder – let alone shattering the glass ceiling. • Dispel the ambition myth. Our research clearly shows that women are just as ambitious as men at the start of their careers. And in the right corporate culture, women (and mothers) maintain that drive and advance. It’s crucial not to make assumptions – nor to spare women stretch assignments or international postings. • Offer flexibility to women and men. Data shows that flexibility is the most important intervention for the retention of both men and women. Millennial men, in particular, place a higher importance on having generous parental leave programmes and childcare onsite. This is another strong example of how diversity benefits everyone – and is an imperative in the talent war. • Pursue sponsorships, not mentorships. Small-scale coffee chats don’t have much effect, but formal sponsorships do. Women benefit when they have a more senior colleague who advocates for them, pushing for those stretch assignments or international roles. • Be conscious of the hidden gems. There are often overlooked opportunities to improve the retention and advancement of women, and these tend not to be cost-prohibitive. Perhaps most surprisingly, engaging men in diversity programmes has a powerful impact. Men make up 85% of senior management. When they get involved, we see three times greater success rates. 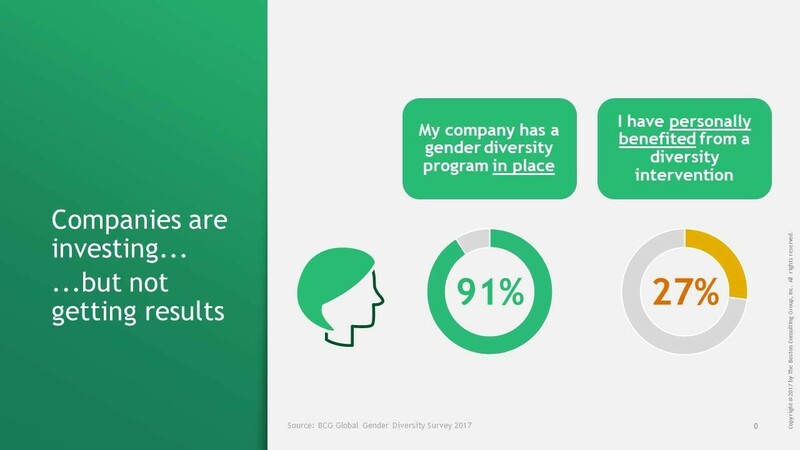 At BCG, where our executive committee is 35% female, there is still plenty of room for improvement. Keep pushing for change no matter your starting point – and no matter the pace of past progress. Even in my home base of Japan, where we still have a long way to go, all of these principles hold true and the numbers are improving. The momentum seems to be there these days – in the news, in the research and in discussions on the ground – and it’s exciting how global the conversation has become. But not every leader of every organization is pushing hard for diversity – far from it. When a homogeneous leadership team feels effective to its members – where everyone is familiar with everyone else’s point of view and communicates comfortably – there may be little incentive to stir up the formula. And others may understand the need for diversity and talk the talk, but become complacent in pushing the agenda because progress has been slow and investments of time and money heavy, while the flow of potential female leaders seems too thin. But this is the truth: without diversity, organizations will eventually fail. Anyone who is happy with the balance they have should step back and rethink their priorities. It’s time for all company leaders to pursue these calls to action and work towards workplace that is thriving and healthy for everyone.